How safe is my money in a Bank On Yourself-type dividend-paying whole life policy? What do the companies recommended by Bank On Yourself Authorized Advisors invest in to protect and grow my money even in volatile times? 1. How safe is my money in a Bank On Yourself-type dividend-paying whole life policy? The Authorized Advisors use companies that have paid dividends every single year for more than 100 years, including during the Great Depression. 2. What do the companies recommended by Bank On Yourself Authorized Advisors invest in to protect and grow my money even in volatile times? They are masters at under-promising and over-delivering and have NEVER missed paying an annual dividend to policyowners for more than 100 years, including during the Great Depression! Every plan is different. Yours would be custom tailored to your unique situation, goals and dreams. To get a referral to an Authorized Advisor who can show you what your bottom-line numbers and results could be with Bank On Yourself, request a free Analysis here. And when the dollar was weak in 2011, Bloomberg.com reported, “a weak dollar may be one of the bright spots in the U.S. economy, and it could be the gift that keeps giving.” The article spelled out several ways the U.S. benefits from a declining dollar. As long as your money is sitting safe and liquid in a dividend-paying whole life policy, it doesn’t take away any of your options, does it? The insurance companies recommended by Bank On Yourself Authorized Advisors have much of their assets in long-term investment-grade fixed-income assets like corporate bonds. When inflation drives up interest rates, bond interest rates typically increase, which can increase policy dividends as well. This is precisely what has happened during high inflation periods in the past. It’s interesting to note that since 1920, according to Federal Reserve Economic Data, corporate bond yields have almost always been higher than inflation. One value of having money in a whole life policy is that you HAVE the money, it is guaranteed to continue to grow, and it will be available for you to use when you need or want it. 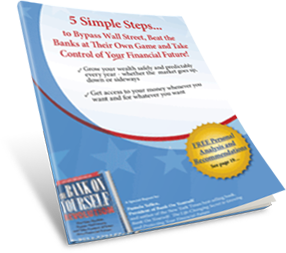 Bank On Yourself policies are designed to become more efficient every single year. 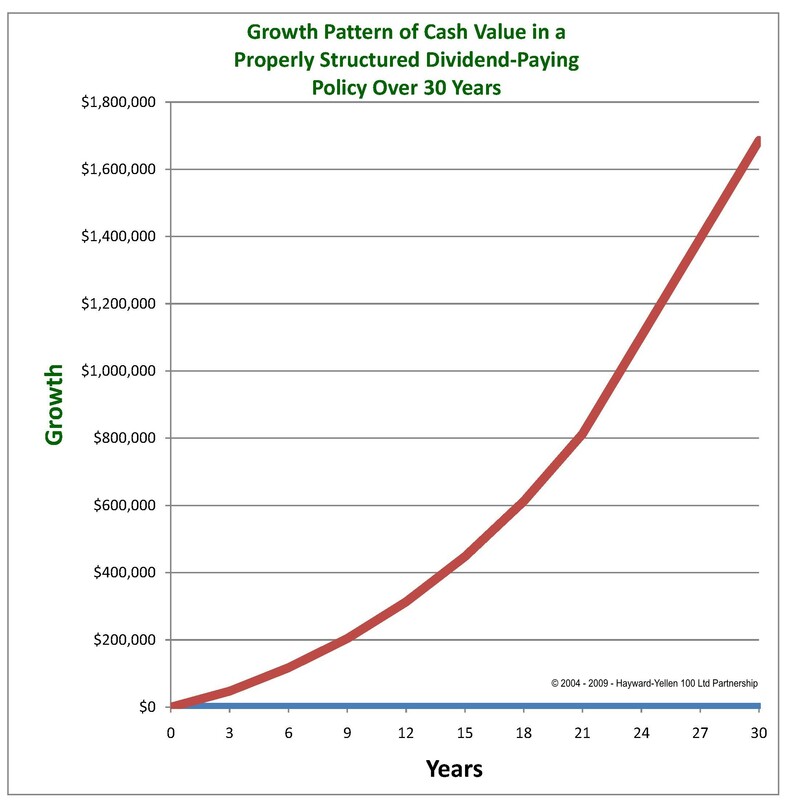 The growth of both your cash value and the death benefit is guaranteed AND exponential, which in itself gives you some protection against inflation on both accounts. Example: If you buy a $250,000 20-year term policy at age forty, and inflation averages only 4% a year during that time, your policy would lose 56% of its value. Your family would get less than half of what you signed on and paid for! Plus, you’ll have nothing at all to show for the premiums you paid, unless you happen to die during the term of the policy (and studies shows only 1% of term policies ever pay a claim). Would you like to see what your bottom-line guaranteed numbers and results would look like if you added a custom-tailored Bank On Yourself policy to your financial plan? Simply request a free, no-obligation Analysis to find out. You’ll also get a referral to a Bank On Yourself Authorized Advisor who can answer all your questions. In a deflationary environment, income is king. So, investors would be struggling to find safe, dependable sources of income. Which means top-quality corporate bonds which provide that income – and which make up a major portion of an insurers portfolio – would boom. Key Point: It’s important to remember that the guaranteed cash values will continue to grow – and the growth gets better every year. 6. Will I miss out if I put money in a Bank On Yourself-type policy and the stock market booms? If you crave the adrenaline rush you get from the volatile roller coaster ride of stocks and other investments, the safe and predictable growth of Bank On Yourself may bore you silly. Well, other than a winning lottery ticket, for most of us, it ain’t gonna’ happen. How many more investment bubbles have to burst before we (really) learn that lesson? The chart below shows the growth curve in a typical Bank On Yourself–type policy. It’s based on the actual growth I’ve received in one of my own polices so far, along with the projected growth based on the current dividend scale. Dividends aren’t guaranteed, but the companies recommended by Bank On yourself Authorized Advisors have paid them every single year for more than 100 years. On the other hand, the stock market has endured long periods during which it went nowhere and lengthy periods of extreme volatility. There’s also the fact that the market can (and does) tank when you least expect it, ruining your best laid plans for a secure financial future. When you Bank On Yourself, there may be times when you feel “left out” – like when your friends start bragging about the killing they’re making in the latest “hot” investment that everyone’s jumping on – real estate, tech or oil stocks, commodities, currency, gold, ostrich farms – you name it. Besides, if an investment opportunity comes up that you want to take advantage of, you can do that by borrowing against the equity or cash value in your Bank On Yourself policy. My best-selling book is loaded with examples of people who did just that. And at least you’ll know you’ll get the same guaranteed annual increase and dividends on the money you borrowed, even if the “hot” investment doesn’t pan out. No two policies are alike, because each is custom tailored to the client’s unique situation and goals, so your numbers and results will look different. But you’ll be able to see what your growth would look like before you make a decision about whether to move forward! You’ll find out when you request a free Analysis here. The design of a Bank On Yourself-type policy gives you great flexibility and built in options that enable you to make adjustments to keep pace with your changing financial situation. For starters, typically at least 50% of your premium will be directed into a “Paid Up Additions Rider” (PUAR), with the rest going towards your “base” premium. The PUAR is the little-known option that significantly supercharges the growth of your cash value. You could have significantly more cash value, especially in the early years, when your policy includes this rider. Bank On Yourself isn’t a magic pill, as I’ve said many times. I don’t believe there are any magic pills. But what I do know is that Bank On Yourself provides a long-term solution to a number of long-term challenges. And the only regret expressed by most people who use it is that they didn’t know about it sooner. There’s no cost or obligation and you have nothing to lose and a world of financial peace of mind to gain.